Indore is a commercial city of the state of Madhya Pradesh, with a population of over 1.5 million. As a city grows both in economic and area terms, transportation becomes a major challenge, and the same is seen in Indore. Traditional modes of traveling like walking and cycling over the years have got less priority over motorized modes in a rapidly growing economy, which have had its pitfalls like congestion, pollution, accidents etc., which make daily commute or walk a highly stressful and risky one. Therefore there is a strong need now to make the city pedestrian friendly by providing them safe walkways and exclusive cycle lanes, thereby promoting healthy lifestyles. The walkability survey interviewed 300 pedestrians at various land use types such as residential, commercial, educational and public transport terminals to analyze travel behaviour, preferences, areas for improvement etc. 1. 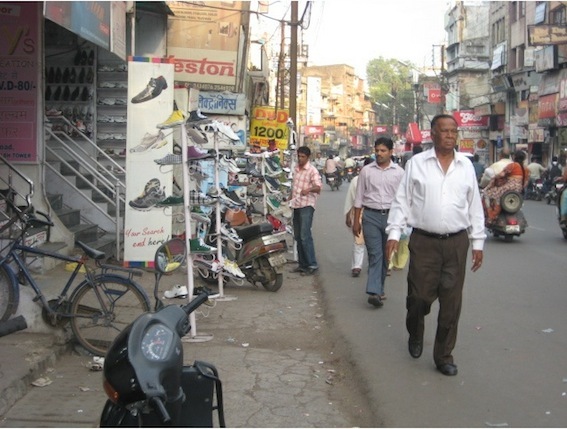 Indore fared poorly in the walkability index with an average of 43 (out of 100). Among the different land use types, Public Transport Terminals scored the least with 36 and residential area the highest with 51. While Commercial and Educational areas scored 38 and 49 respectively. Commercial, educational areas and public transport terminals lack proper footpaths and other facilities that pedestrians have to compete with vehicles for space, making it a one sided contest. 2. Among the nine parameters used to gauge walkability, infrastructure for people with special needs scored the lowest with 30 and security from crime scored highest at 53, Walking path modal conflict and availability of walking paths scored 50 and 47 respectively. People on wheelchairs and other disabilities have little or no mobility on the city roads, with uneven, discontinuous pavements, absence of ramps and handrails, forcing them to use their private vehicles, or making their daily commute a struggle. For people who cannot afford a vehicle, the city is unforgiving, thereby denying equal opportunities to all. Safety from crime scored lower than the Indian average of 60 making pedestrians walk without much fear. 3. 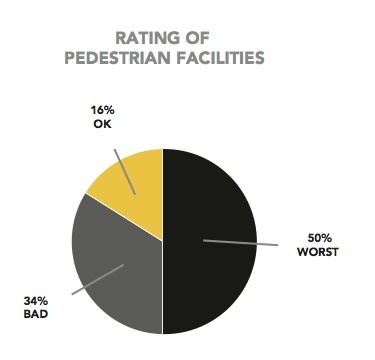 In the rating of existing pedestrian facilities, 84% felt that it was worst to bad and 16% felt it was ok. Since a large percentage of pedestrians had a bad opinion about the pedestrian infrastructure and facilities accessible to them, it can definitely be inferred that they would like to see better facilities, which need not be capital intensive. 69% of people wanted at grade crossings at an average interval of 100m, and 84% of respondents wanted more crossing points while 68% wanted slower vehicle speeds on the roads to help them cross the road safely. Both can be achieved by good designs and traffic calming measures such as signboards and speed breakers, without compromising on the vehicular speeds. Policy makers have always avoided providing at grade crossings at regular intervals in order to provide greater speeds to vehicles. This is a myth since it will only attract more vehicles and lead to more congestion and ultimately reduced speed of vehicles. 68% wanted removal of encroachments, including vehicles parked on footpaths to make easier trips. 64% wanted better facilities for differently abled people, while 60% wanted improved street lighting, wide, clean and level footpaths. 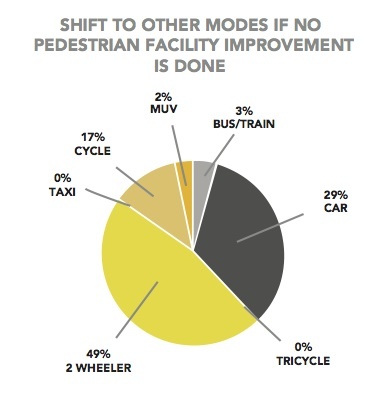 If no improvements were carried out for pedestrian facilities, 49% wanted to shift to two wheelers and 29% to cars. There has been a continuous shift from NMT to motorized modes and lack of improvement in NMT facilities is one of the reasons. 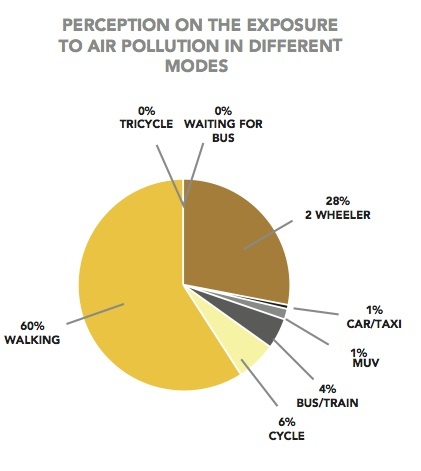 Exposure to air pollution is also a deterrent to walking with 60% saying they are most exposed to air pollution when they are walking and 6% when they are cycling and 28% and 4% when they are travelling on two wheelers and bus respectively. The 66% have no emissions while being exposed to most pollution, which is ironical and will widen the rich and poor divide. Download the Walkability India Fact sheet here.